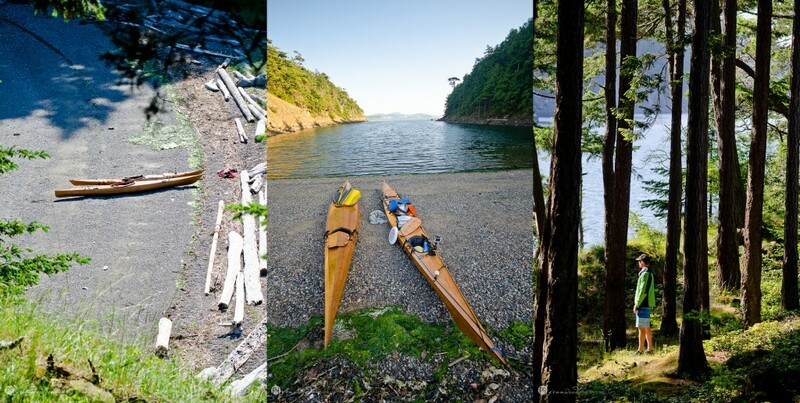 The San Juan Islands are one of those iconic Northwest paddling destinations I am lucky to say I have explored a number of times. Cypress Island is one of the wildest and unpopulated large islands due to the fact there is no ferry access and most of the Island is Department of Natural Resources, DNR land. 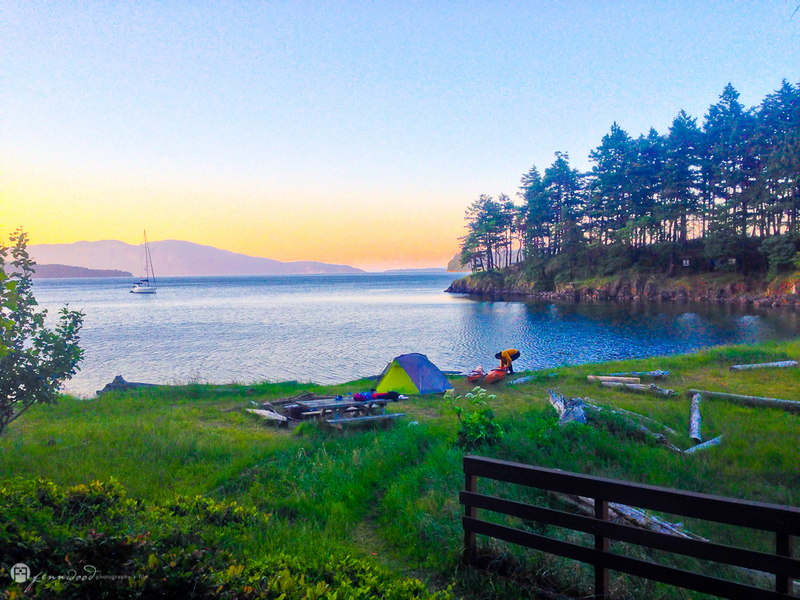 The island has beautiful hikes, lovely beaches, and great free camping, making it a wonderful destination to avoid many of the more annoying issues that come up when planning a trip to the San Juan Islands. 1: Catching a ferry on a hot sunny summer’s day when everyone and their mother, brother, and 7 children want to escape the city can take up your entire first day of precious paddling time. 2: If you do succeed in catching one of those elusive boats after a 2-4 hour wait, you have to cough up the moolah, at best about $50 for two people; I have paid over $200 for two cars and 5 people. 3: When you are finally on the island of your choice, you have to find somewhere to put in your boat and park your car while you are away on the water, which can cost another bundle of $$$. Click here for more info on San Juan ferry prices. An overnight trip to Cypress is amazingly hassle free, no ferries, no parking fees and free camping with amazingly odor-free composting toilets, thanks DNR! Warning: This route involves crossing high traffic areas and strong currents. It is only recommended for experienced paddlers who have mastered self-rescue techniques in cold water and understand how to read current and tide charts. 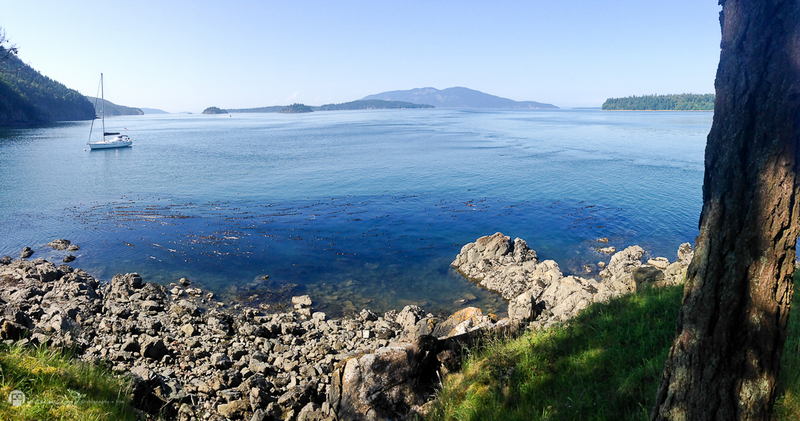 Anacortes is a relatively close drive from the urban hubs of Seattle or Vancouver BC. I live in-between in Bellingham, WA, so we just popped on I-5 and in 45 minutes were driving down the sprawling main drag towards the water with a Murrelet SDC and a Coho Hi atop our Subaru. 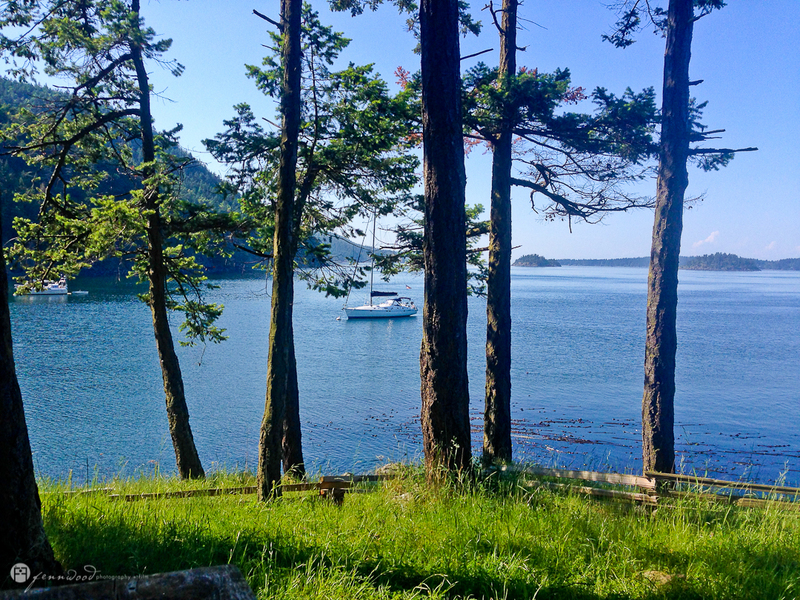 There are a number of places you can get to the water in Anacortes but the hardest part is finding somewhere you can park your car for a night or two. 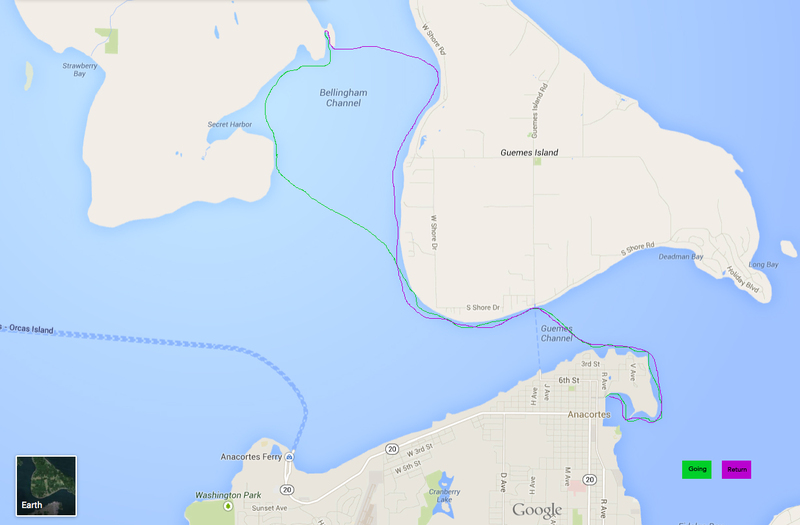 We settled on The Port of Anacortes. There is a low dock where you can easily launch your kayaks, and I think you can also put in at Seafarers’ Park. We decided to launch off the dock close to one of the long term 24-hour parking lots. 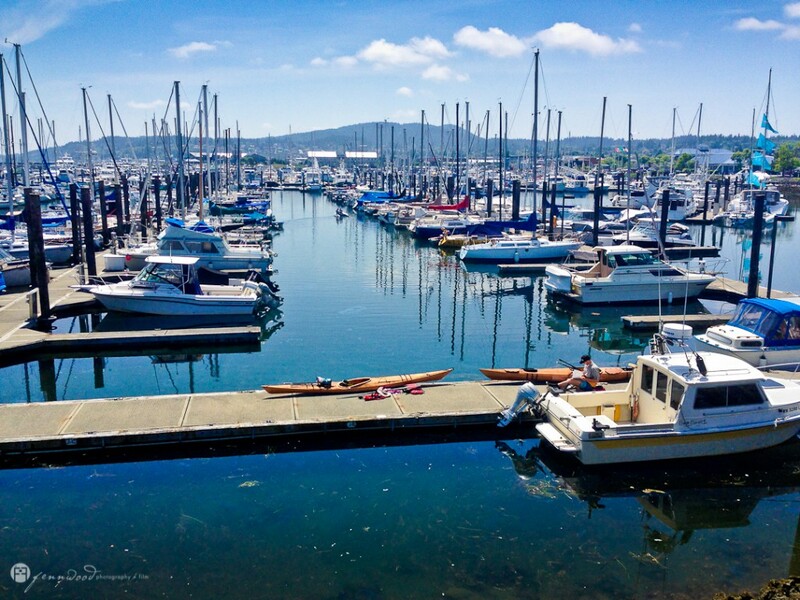 Drive around, talk to folks in the marina, and decide where you want to launch your boats and park. 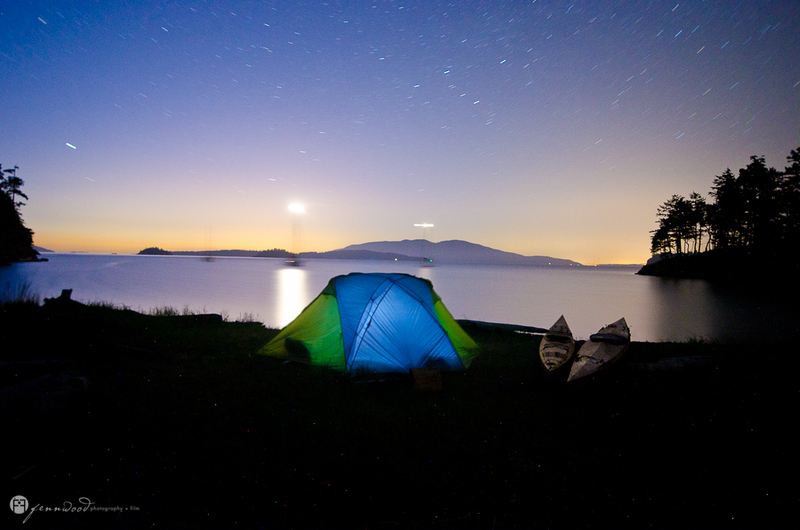 Any trip in the San Juan Islands needs to be timed with the tides. 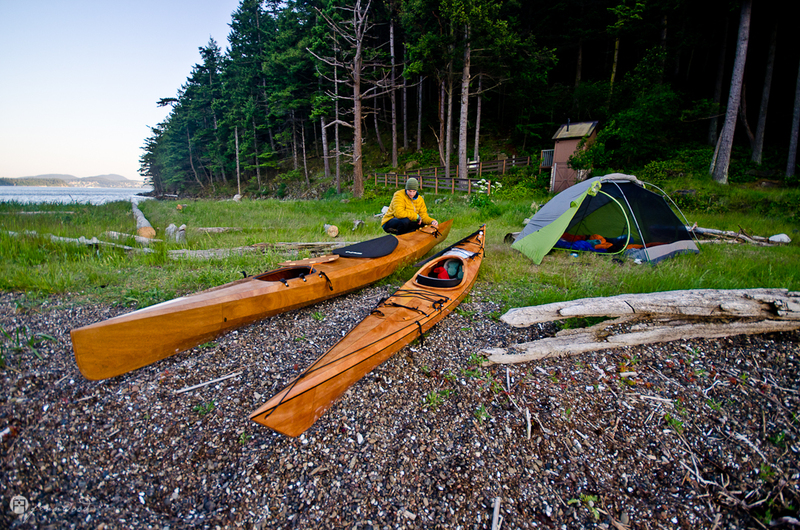 Timing travel with tides makes traveling longer distances much easier and paddling a breeze. 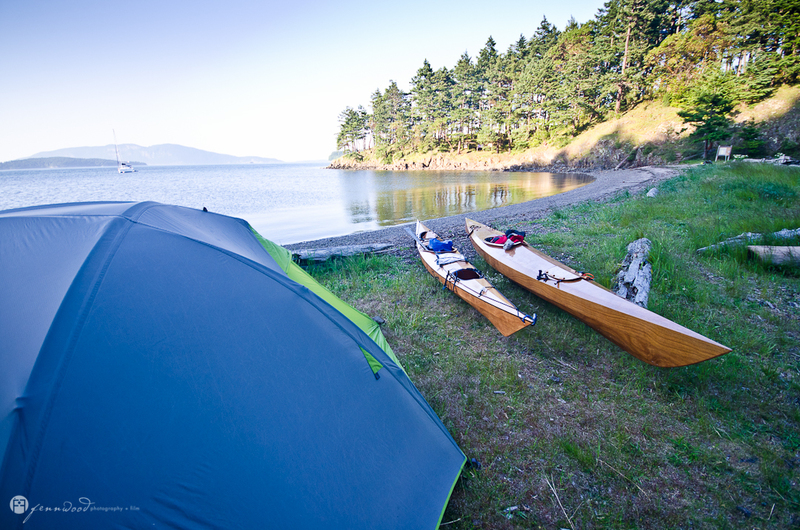 You don’t often realize how much the tide is helping you until you begin paddling against it. Make sure before you do any trip on salt water that you understand the tide cycle you are in and the hazards in the area you are going. We made all our crossings in glassy calm conditions. It is best to not cross channels like Bellingham or Guemes Channel in strong winds, especially if the wind is going against the tide. Before you begin this trip make sure the wind forecast is relatively calm. If not, you had better be an experienced paddler with proper cold water paddling clothing and good self-rescue skills. Recommended Tide Table book. 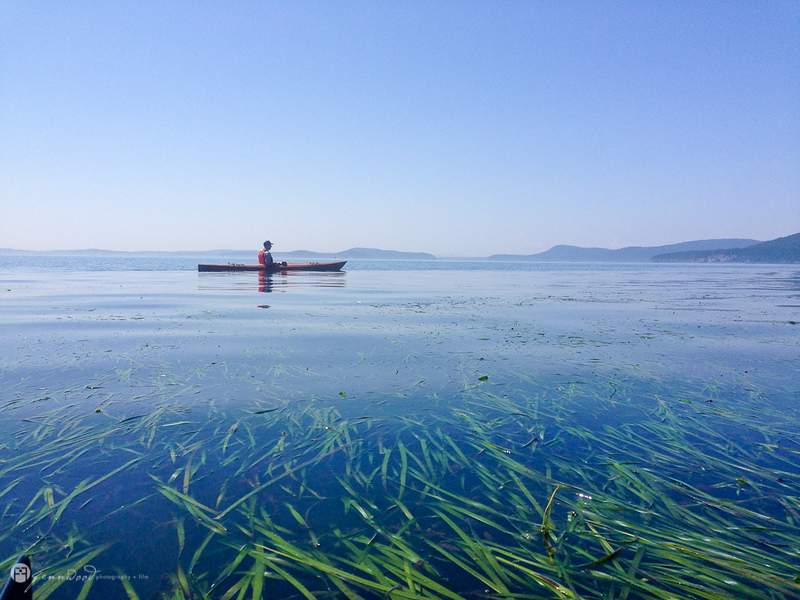 When paddling from Anacortes to Cypress Head it is easiest to time it so you are catching an Ebb (outgoing tide) and then catch the flood (incoming tide) when you round the corner of Guemes Island to begin your crossing of Bellingham Channel to Cypress Island. We started about an hour before slack tide and were rounding the corner where the tides change at slack and then rode the flood over to our night’s camp on Cypress Head. After our boats were packed, we paddled out of the marina and headed left around the corner following the shoreline. Guemes Channel, which separates the mainland from Guemes Island, is a main boat traffic way and is quite crowded. Watch the boats and pick your crossing according. Make sure to not cross the Anacortes Guemes Island Ferry route when crossing. Paddle across going with the tide and watch out for boat wake; the large boats are not very observant or considerate of small craft so watch out for yourself. The paddle along Guemes Island is quite nice, especially as you round the corner and start going up the Bellingham Channel. We were lucky to hit it at low tide going into slack and then ebb. There is some lovely sea life in the eel grass and it is fun to just let the tide pull you along, look down into the water and see the underwater world float by. When we hit Bellingham Channel the tide had changed and was now pushing us North through the channel. We decided to make a longer crossing and go diagonally towards Cypress Head camp, as it it is easier to ride the tide over. If we had crossed in the narrower section of the channel we would have had to cross against the tide instead of using it to get over. The weather was good, so we decided the longer crossing was ok given the conditions. We hit Cypress a mile or so before our camping destination and followed the coast up. 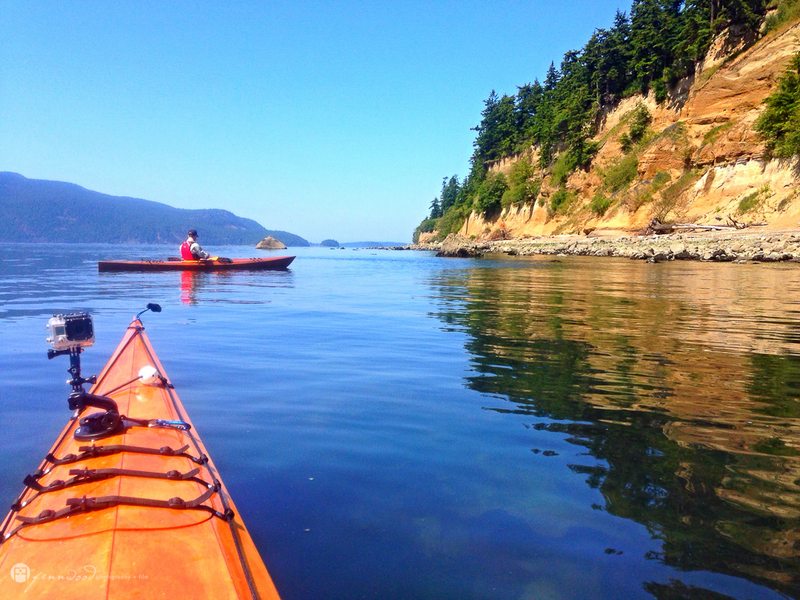 A rocky shore with a mixed forest of evergreens and Madrona trees makes for nice paddling views. Before we knew it we were pulling into the small South-facing bay of Cypress Head, which sticks out into the channel. The bay is very shallow on the front side and only small boats can get in. We pulled up on the beach, stretched our legs and congratulated ourselves on a safe, fun and smooth paddle. 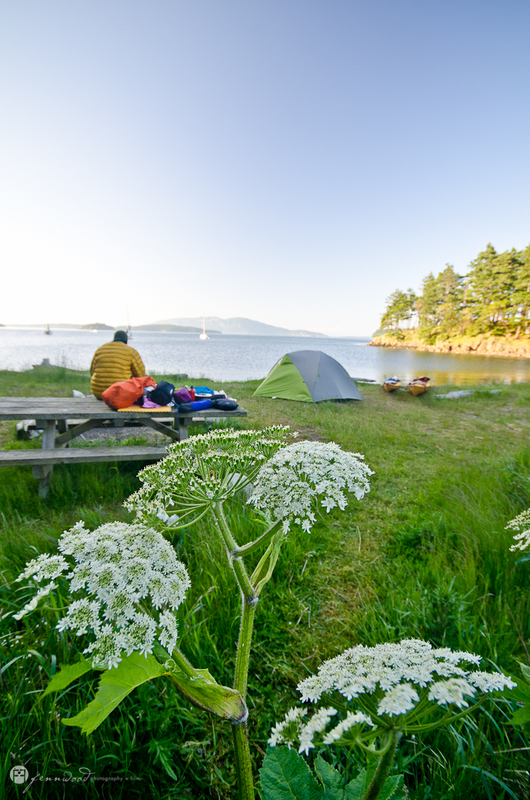 Cypress Head has beautiful campsites tucked on the low sand bar that connect the island to the head and then beautiful sites tucked into the trees. They are very well kept and amazingly free. Managed by the DNR (Department of Natural Resources) it is truly a gem to find a campsite of this quality that is still free. Over by the composting toilet there is a board that outlines the many hiking trails on the island. Take advantage of the hiking: we were told that Cypress Lake is the nicest lake but since we were just there overnight we decided to hike up to Bradley Lake, which took a few hours and was a wonderful hike. 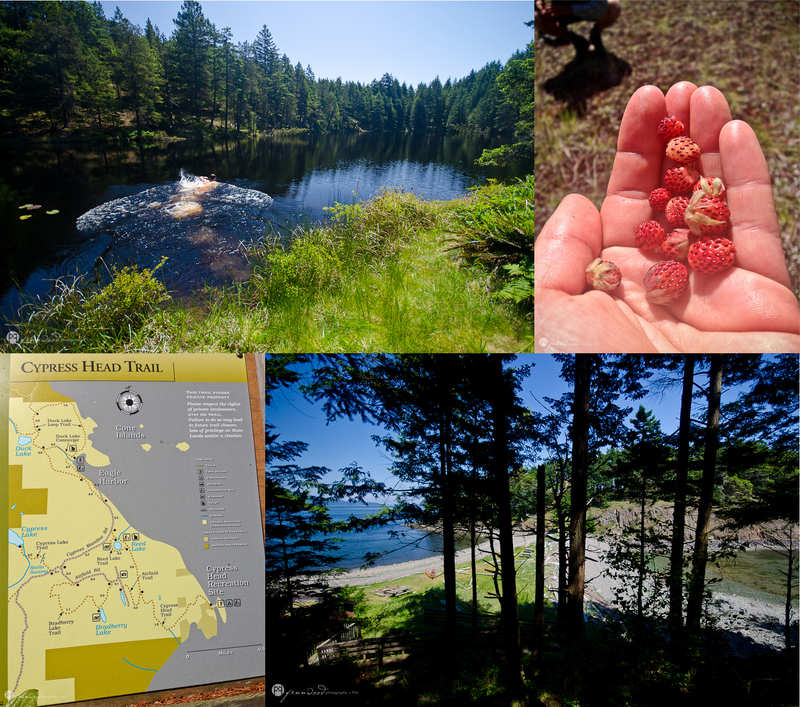 Along the way we found a field full of wild strawberries and when we got to the lake we found a grassy spot where we dried off after jumping into the cool water. At night we watched the stars come out and the moored sailboats bob in the light breeze. 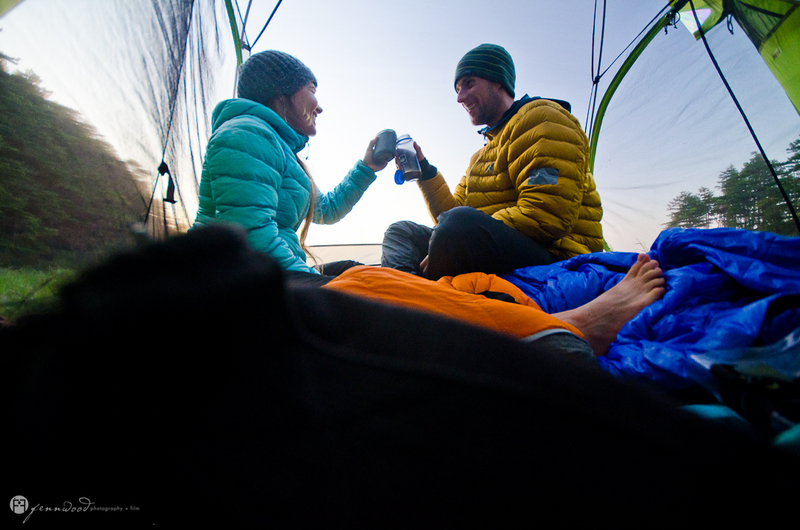 We sipped our hot chocolate and marveled at another beautiful night in the Pacific Northwest, made even better because we had paddled our Pygmy Boats there. 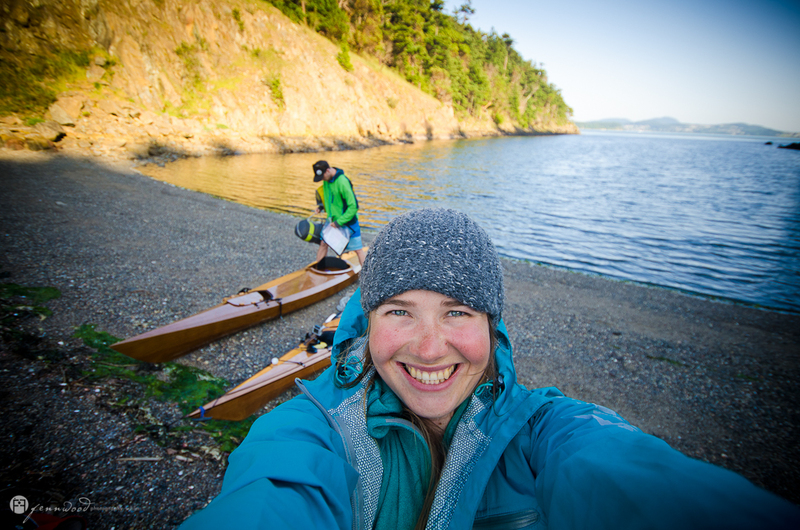 In the morning we packed up and crossed back to Guemes Island, then on to the mainland, pushed along by the tide, enjoying calm beautiful paddle strokes and that little pang of sadness you feel when leaving a beautiful place. Freya Fennwood is a photographer, writer, paddler and adventurer. Daughter of Pygmy owner, John Lockwood, she has been paddling a Pygmy Boat since she was 5 years old. 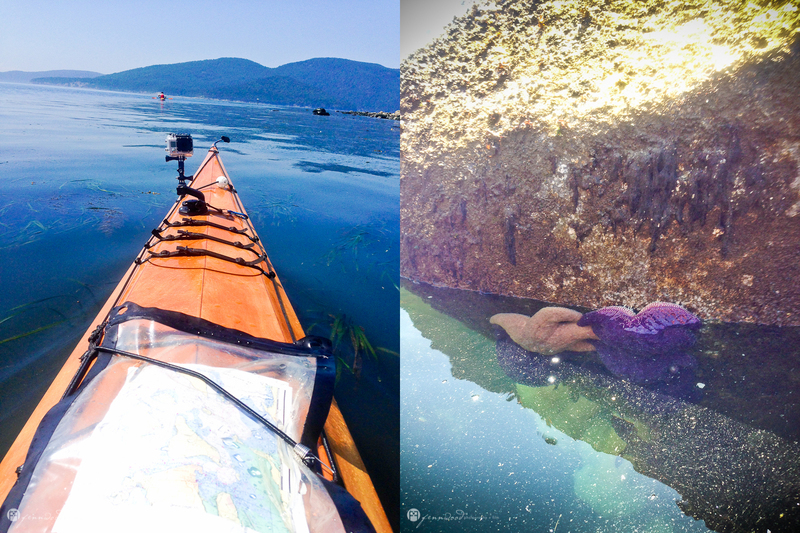 Exploring the world by small boat and lens is her way of life. You can find more of her stories on the Pygmy website. Most of the images on our website are hers as well, if you would like to see more of her work click here.